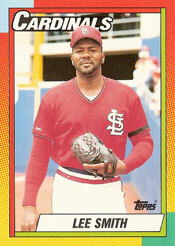 Lee Smith was the first Cardinals reliever to record 40 saves in consecutive seasons. The only other Cardinals reliever to match the feat was Trevor Rosenthal. Smith, elected to the National Baseball Hall of Fame on Dec. 9, 2018, twice had back-to-back 40-save seasons: 1991-1992 and 1992-1993. He had 47 saves in 1991, 43 in 1992 and 43 again in 1993. Rosenthal had 45 saves in 2014 and 48 in 2015. On Sept. 22, 1992, at Pittsburgh, Smith earned his 40th save of the year and became the first National Leaguer to achieve consecutive 40-save seasons. Smith retired all three batters he faced in the ninth _ Don Slaught, Gary Varsho and Dave Clark _ on fly outs, sealing a 5-4 Cardinals victory and a win for starter Rheal Cormier. The victory was the Cardinals’ third in 18 games against the 1992 Pirates. “Sanity-wise, this was important,” Smith said. The save didn’t come without drama. When Clark lined a drive to right-center, right fielder Felix Jose, thinking center fielder Ray Lankford would make the catch, pulled up. Lunging for it at the last moment, Jose snared it. In 1993, Smith had an ERA of 4.66 when he earned his 40th save of the year on Aug. 14 at Montreal. Smith became the first National League pitcher with three successive 40-save seasons and was the fastest to 40 of any big-league pitcher. Smith got that 40th save in the Cardinals’ 117th game, breaking the record of 118 established by Thigpen with the White Sox in 1990. The save was Smith’s 395th of his career. He would finish with 478 in 18 seasons. “For a guy who’s been pitching like a caveman, 40 saves isn’t too bad,” Smith said. Less than three weeks later, the Cardinals traded Smith to the Yankees for pitcher Rich Batchelor. Smith’s three-year, $8 million contract was expiring after the season and the Cardinals, not expecting to re-sign him before he entered free agency, decided to get a player for him in return.